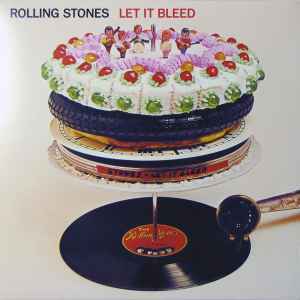 Group credited as "Rolling Stones" on sleeve front, and as "The Rolling Stones" on the inner sleeve and record labels. Instructions on inner sleeve and record labels: "This Record Should Be Played Loud"
Great album. First copy I acquired had two big streaks or red, and some black, in the clear vinyl. Second copy was fine. Sounds decent, gimme shelter doesn't sound good and vocals are a little hot on country honk but there is great prescence and clarity on most tracks. Bass sounds good, drums sound good, acoustic guitar sounds bright. Pressed flat, quiet, no flaws there, ok release. Sounds as good as it can for DSD but just like everything pressed from digital the vocals end up sounding horribly compressed.. Let it bleed and midnight rambler sound rad. Gimmie Shelter opens the Rolling Stones 14th [?] album, and let me tell you, shelter is just what I needed having just arrived in Vietnam, courtesy of my wonderful Uncle, who went by the name of Sam. The album came out in December of 1969 but I wasn’t able to grab hold of it until sometime late in January of 1970 once I was settled in, squared away my hooch and bought myself a little bitty of a record player. But hey, I draped the inside of my living quarters with an orange parachute, had my candles, and constant light show every evening. What more did I need ... ya we had that too. I wasn’t the only one in transition, the Stones were breaking in the new boy Mick Taylor, Brian Jones had died a few months earlier, and the peculiar feeling of hearing new material from someone no longer on the planet was as unworldly as the new country I would be calling home for the next 26 months. There has been a great deal made regarding the fact that up to this point the Stones had not been making albums with a consistent body of material, and many lumped this release into that category. I’ll be the first to admit that there are a couple of songs that didn’t strike my fancy, but man, this was one of the best records I had ever heard at that point in time. I’ll never forget hearing the beginning of "Country Honk," an obvious remake of "Honky Tonk Woman" and the little car horn that blew just perfectly enough to startle me every time I heard it. All of the songs were much longer, extended in a number of ways more then usual and a fine follow up to Begger’s Banquet for sure. The album is darker, more sensual ... it felt like a “time out,” the mask of Janus, between the psychedelic era that was winding down, and what was waiting around the corner, just out of view. For me, the 60’s were very heady, full of self exploration, movement, conflict, a sensory overload ... but here on this release, it was like everything just slowed down, as if to say, "Let’s just pull the shades, get high and stay in bed for a while." Now I love the Blues, and it’s just my opinion, but for me, on the whole, this is the closest the Stones ever came to making that down home blues music they always professed to love and touted as the genesis of their conception. And the reason for that can be seen, or better heard, with the talent they assembled here with the likes of Ry Cooder, Al Kooper, Leon Russell, Nicky Hopkins, Ian Stewart, Bobby Keys and a host of others that I’m sure I’ve omitted. There does seem to be a theme here, though I’ll leave that for each of you to figure out for yourselves, as this is one of the most personal albums the Stones ever surfaced. For me, the only song that seems out of place here is "Monkey Man" and even that works as a juxtaposition, revving up the music, only to slow it down again with the final track. The consistent beat and timing is not redundant, it just lets you ride the nod for all it’s worth. The music is smooth, full, rich, sparkled with great little background touches, along with vocals and musical expressions which often times require headphones. Me [? ], I just crank it up loud. You’re going to hear some terrific guitar riffs, elegant slide, some really perfect harp licks and a bass line from Bill that he’s been working towards for his whole life. Everything came together here, even Keith lays down some flawless vocals and Mick has never sounded better. "You Can’t Always Get What You Want" finishes up this release in an amazingly unexpected fashion, an extraordinary vision in it’s concept and story line, and even with all it’s darkness, left me with the feeling that there was hope just around the bend, in the dawn of a new sunrise. This album is a moment in time, a story within a story, a snapshot that will never yellow with age. *** Jump forward to 2013, which sees the release of this dynamic sonic gem on 180g vinyl, pressed on clear plastic, and you're gonna treat your ears to something special. I've always wondered what it would be like to hear this album again for the very first time, and let me assure you, it was worth the wait.